Want to digitize glorious manuscripts? Apply here! Bryn Mawr College MS 24 (Lawrence Hours), fol. 21. 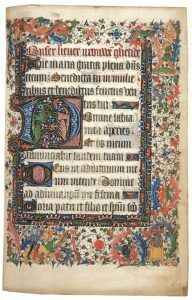 Book of Hours for Cambrai Use, Flanders, 1440s, vellum, 7-7/8 x 5-9/16 inches (200 x 142 mm). Hours: 15 – 20 hours per week, with hours to be worked during the Special Collections Department open hours (9:00 – 4:30, M-F). This is a grant-funded position that is tied to the completion of the work on the Bryn Mawr and Haverford medieval manuscripts. The duration of the project will depend on the number of hours worked per week, but we anticipate that the position will last between six and nine months. Position Description: The Bryn Mawr College Special Collections Department seeks applicants for a part-time, temporary position assisting with the digitization of medieval manuscripts for the Bibliotheca Philadelphiensis (BiblioPhilly) project. Working with medieval manuscripts from Bryn Mawr College as well as Haverford College, the work will involve digitization, post-processing, and quality control as well as assistance with submitting content to OPenn, the project’s manuscript portal. The Project Assistant reports to the Digital Collections Librarian, and works with the Curator of Rare Books and Manuscripts and the Director of Special Collections. This is an excellent opportunity to work closely with a large number of medieval manuscripts, and may be of particular interest to those considering a special collections career. Required: Bachelor’s degree; experience working with special collections found within libraries, archives and/or museums; ability to work with close attention to detail; familiarity with Adobe Photoshop; good manual dexterity with the ability to concentrate on tasks that require careful handling of delicate materials; and the ability to stand for prolonged periods using an overhead book scanner. Preferred: Currently enrolled in, or recent graduate of, Masters program in Library and/or Information Science; familiarity with digital imaging of special collections and digitization software (including Adobe Bridge) as well as overhead book scanners; experience handling special collections; an interest in medieval manuscripts.